Before I show you the tag I made I want to remind you that today started a new challenge at Crafty ribbons challenge blog. 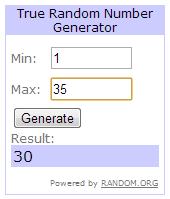 The theme is "anything goes with ribbon" and you have 2 weeks to upload your creations. I hope you will come play with us! I didn't use any design papers for this tag. I just recycled some wrapping paper (the purple and the brown one) and white cardstock.First I cut out the tag from the white cardstrock and covered it with purple paper. I inked the edges of the tag and the purple paper with my ink pad. Then I added doily (you have to look really closely if you want to see it peeking out from behind the embossed piece of paper). Over that I glued a piece of white cardstock which I first embossed with Craft concepts' cottage floral embossing folder and then inked the raised parts with my ink pad. I used my border punch to create the border. 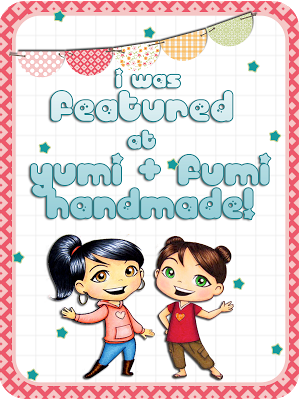 For my main image I used the adorable Yumi stamp from Yumi and Fumi handmade. I colored her with Promarkers and Faber Castel pencils. 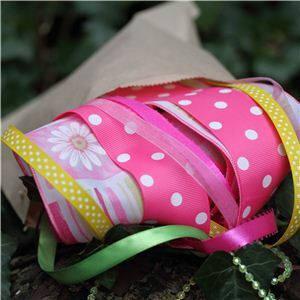 If you don't know yet, there's a fun event going on at Yumi and Fumi handmade blog. You really should check it out if you haven't already. As you probably noticed I used a lot of die cuts on my tag. The corner and the butterfly are Spellbinders dies. I inked the corner die cut with my ink pad and as for the butterfly goes, I used my home-made "glimmer mist" on it. Unfortunately you can't see this in the image, but it sparkles really nicely in person. The leaves, flower and swirl are die cuts too. But those I got. My friend once let me borrow her Marianne design flower and leaves die so I made quite some of those and the swirl die cut came a while back from one lovely lady who won my candy and then sent me some die cuts as a thank you. The small flowers are made with my craft punch. For the center of the small flowers I used Viva decor pearl pen and for the center of the big flower and on the butterfly I used some pearls from my stash. Ribbon came from my stash as well. I had a lovely, calm weekend and I got to do quite some crafting. Here's one of the cards I made. Let me apologize in advance because the picture isn't the best, but the weather has been yucky for the last couple of days. I needed a birthday card for one girl, so this is what I came up with. I hope she will like it! I thought that this adorable image from Yumi and Fumi Handmade would be perfect, so I inked it up. I colored the image with Promarkers and Faber Castell pencils. I decided to use this fab green and pink glittery paper that I got from my friend La Vikinga (thank you hun!!!). The doily is from my stash. The tiny butterflies were made with my craft punch and the flower is a Marianne design die. On the flower and on the heart of Yumi's sweater I used some glitter glue. I created the "banner" with my scissors. The sentiment is a G Studio stamp. I also used Spellbinders scalloped circle die (behind the image) and another Spellbinders die for the corner. The white satin ribbon, the pink and green striped ribbon and the green button I used for the center of my flower are from Crafty ribbons.